The Huawei Mate 9 is a phablet that's built to last, with an impressive camera, powerful processor and great battery life. It's just let down a little by a larger price tag than we've come to expect from the brand. Update: Huawei has now released both the Mate 10 and Mate 10 Pro, which replace the Mate 9 from its top end line up. That means the price of the Mate 9 may drop down soon too. Original review: Huawei's Mate 9 is a phone that's equal parts Samsung Galaxy Note 7 (minus the fire) and iPhone 7, mixed in with the brand's own design sensibilities both inside and out. It's a Note in that it's a large-screened device, which instantly pushes it into the realm of 'power user' and the enterprise space, a claim backed up by the fact that it features the newest, most powerful chipset, also from Huawei. But it's also aiming for the consumer-friendliness of the iPhone, offering strong cameras, long battery life and increased day to day usability in the long term, something Huawei is keen to talk up. This is Huawei's big effort to break into the US market, and push itself from being the world's third-biggest phone manufacturer to second place by the end of 2018. Whether it will succeed is yet to be seen, but this is the phone the company hopes will help dislodge Apple from its runner-up position behind Samsung when it comes to phone sales. Huawei's Mate 9 launched at $599.99 or £579.99, while in the rest of Europe it cost €699. Those in Australia can also buy the phone for AU$999, but if you shop around you may be able to find a slightly cheaper deal. Those in the US can now also get the Mate 9 for only $499.99 after it received a permanent price drop but there's no word of a price cut in the UK or Australia. If you'd rather spend money each month on the Mate 9, we've seen good deals in the UK offering 4GB of data for around £30 a month and an upfront cost of £100. Huawei has tried to improve every element of the Mate 9 to keep the Mate series relevant in a market that's full of impressive phablet devices. A key selling point is that this is one of the world's first Daydream-ready phones. That means it'll be ready to work with the Daydream VR platform when Google launches its Daydream View headset at the end of 2016. The phone is set up with a strong processor to ensure it can run the apps and games it will need to, but we haven't yet been able to test it out with Daydream. Considering it doesn't feature a 2K display, however, we expect the Huawei Mate 9 won't be as good for VR as, say, the Pixel XL with Daydream or the Samsung Galaxy S7 Edge with a Gear VR. Another big selling point of the Huawei Mate 9 is its durability. If you only upgrade your phone once every few years, you don't want the processing power to drop off after only six months of use. To that end Huawei has included its own Machine Learning Algorithm in the Mate 9, which is designed to ensure your phone gets faster over time. It adapts to the way you use your device, and will use this information to prioritise the performance of features you use most often over apps and services you don't use as much. The Mate 9 has more than 1,000 different functions that can be tweaked, and Huawei says MLA can offer a 20% increase in smoothness of performance, a 50% improvement in system response times and a 20% boost to the graphics read/write speeds. 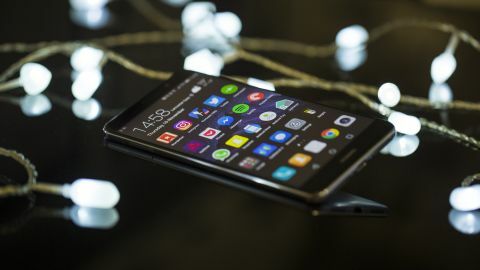 We haven't been able to try out this feature yet, as we've only had the phone for a week of testing, but Huawei is certainly confident that this phone is only going to improve the longer you own it. If you’ve used a Huawei Mate 8, you’ll recognize much of the design language used on the Mate 9. Huawei hasn't seen fit to update it much for the new phone, but it's still a well-built handset. There's a full metal unibody design, which feels premium in the hand. There are very slightly curved edges on the front and back of the phone, which helps it to sit in the hand better than the Mate 8 did. It's not as comfortable to hold as some other phablets, such as the Samsung Galaxy S7 Edge, but it's better than the Sony Xperia Z5 Premium. If you’re used to smaller devices the Huawei Mate 9 may not be the best choice for you, as it's a larger phone, and some will find it unwieldy. It measures 157 x 79 x 7.9mm, making it a very similar size to the iPhone 7 Plus. You get more screen on the Mate 9 compared to the iPhone 7 Plus, though, as the bezels aren't as thick. There's a fingerprint scanner on the back of the device, underneath the Leica branded dual-lens camera. It's a comfortable location when you're holding the phone in your hand, but if you regularly lay your phone down on a desk you may find it irritating – you'll need to pick up the phone to unlock it, or press the power button and unlock the phone on screen with your PIN or password. On the bottom edge are two speaker grilles, either side of a USB-C slot for charging and data transfer. Some good news, if you were concerned about Huawei following Apple's lead, is that the Mate 9 features a 3.5mm headphone jack. It's on the top edge of the phone on the right hand side, which makes it easy to listen to music when the phone is in a pocket. The power button – which you probably won't reach for that often if you’re using the fingerprint scanner on the back of the phone – sits on the right-hand edge. The Huawei Mate 9 isn’t an exciting-looking phone. It looks premium, but it doesn’t have that distinctive look that phones like the more powerful and pricy Huawei Mate 9 Porsche Design, or the Samsung Galaxy S7 Edge, offer. It’s just more of the same again, although for most people that won’t be an issue. Some Huawei watchers were disappointed when it was announced that the Huawei Mate 9 didn't have a QHD panel, and it would certainly have been better if the company had upgraded the screen rather than keeping it Full HD. The Mate 9 Porsche Design features an incredible QHD screen, which the Mate 9 would have really benefited from. It is unclear why the company didn’t see fit to upgrade it for the 'standard' version of its new phone. It would have been nice to have a QHD screen for watching video and looking at photos, but it's a particular let-down given the recent launch of Google Daydream and Huawei VR headsets. Huawei makes a point of noting that the Mate 9 is a Daydream-ready VR headset, but a higher-resolution screen would make for a far better virtual reality experience, and it feels like Huawei has shot itself in the foot by limiting its latest flagship to Full HD. For general use, though, the 5.9-inch, 1920 x 1080 screen will suit you just fine. It works out to a relatively meagre 373 pixels per inch, but when viewing general content it looks similar to most other phones you can buy right now. If you're looking for a higher-quality image when watching video, you might be better off going for a Sony Xperia Z5 Premium with its 4K screen, or even a Google Pixel XL. The viewing angles with the screen are impressive, though, and it has a real impact when you turn up the brightness on the display. There's an auto-brightness mode, although most of the time we were using the phone we kept it on full brightness for maximum effect.